To kick off this week's FPF photos we have Auburn students Katie, Emily, Hannah, Meagan, Jennifer, Ana Marie, Elizabeth, Mary Katherine, Anna, Anna Katherine, and Whitney. 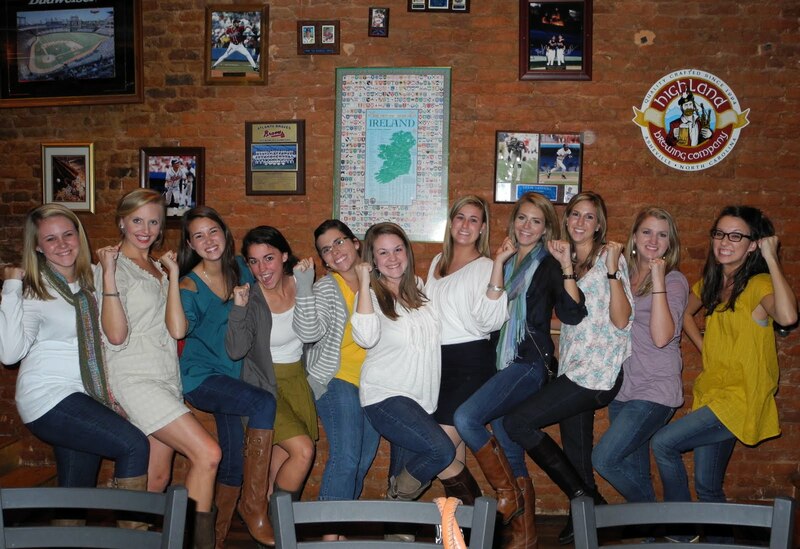 These chickies celebrated Ana Marie's 21st Birthday at the Irish Bread Pub in Opelika, AL! Lastly, meet Cara and her college roommate Stephanie who threw fist pumps and leg kicks while hiking in Alaska. Bonus points for glaciers and reunions with dear friends! Can you believe we only had 2 FPF photo submissions this week?! Ya'll must have been taking naps or studying for midterms. That said, I'm really looking forward to next week's FPF Challenge! Send in a photo of you and your homies throwing fist pumps and leg kicks in your Halloween costumes. Bonus points for creativity and glitter. I almost sent you one of Mikey Pops. But...I forgot. Maybe I can convince my twins to take one in their costumes. These area always fun posts. jes, twinner costumes are the best!